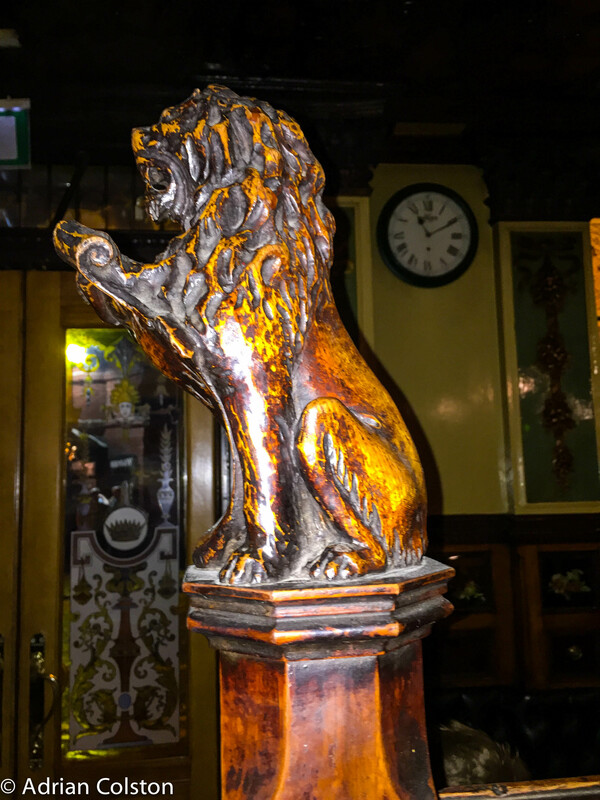 The Crown Liquor Saloon is a Victorian Gothic public house (or Gin Palace) which is owned by the National Trust (one of 61 owned by the NT!). 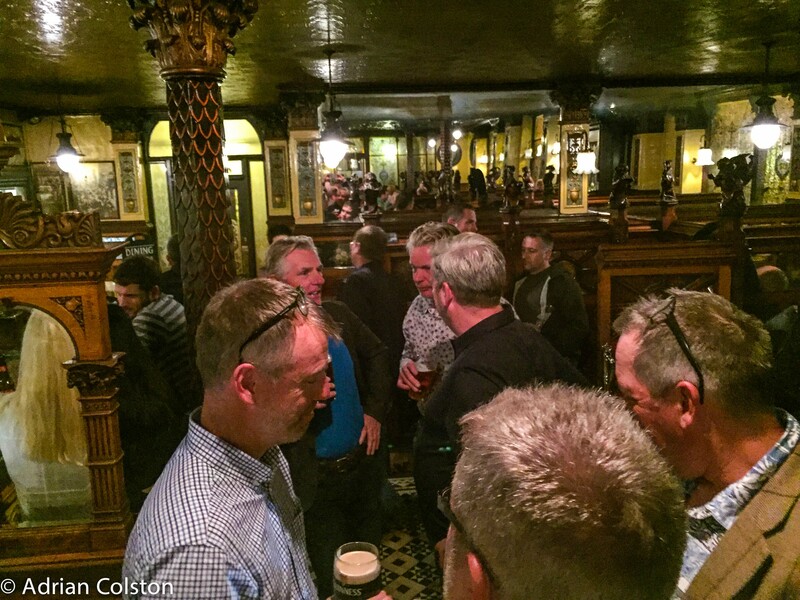 It is still run as a very popular pub. This is how the NT website describes the place. 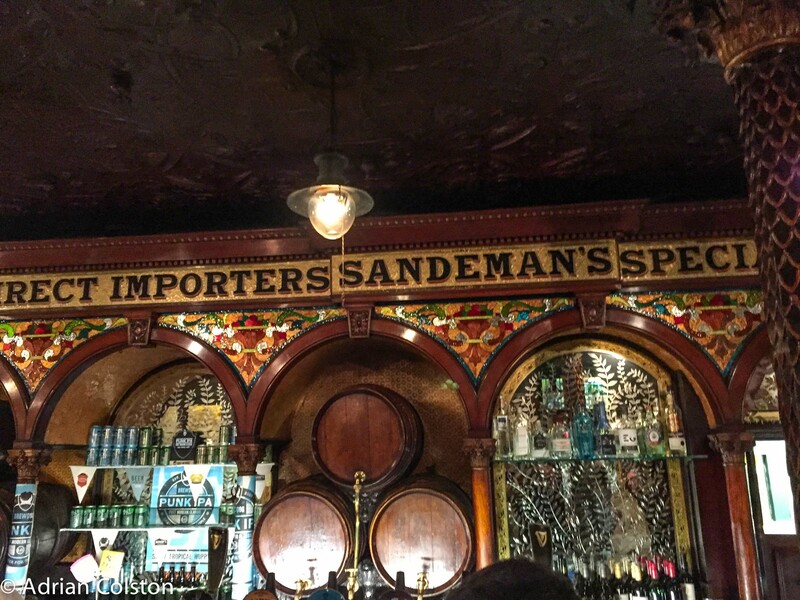 “The most famous pub in Belfast. Wonderful atmospheric setting, with period gas lighting and cosy snugs. 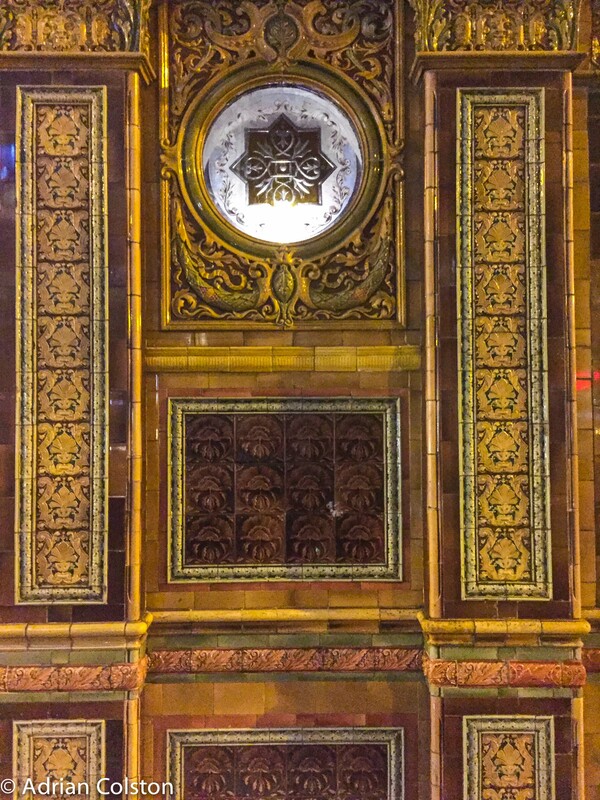 Ornate interior of brightly coloured tiles, carvings and glass. The Crown was acquired by the National Trust in 1978 following a campaign to save it led by Sir John Betjeman among other. 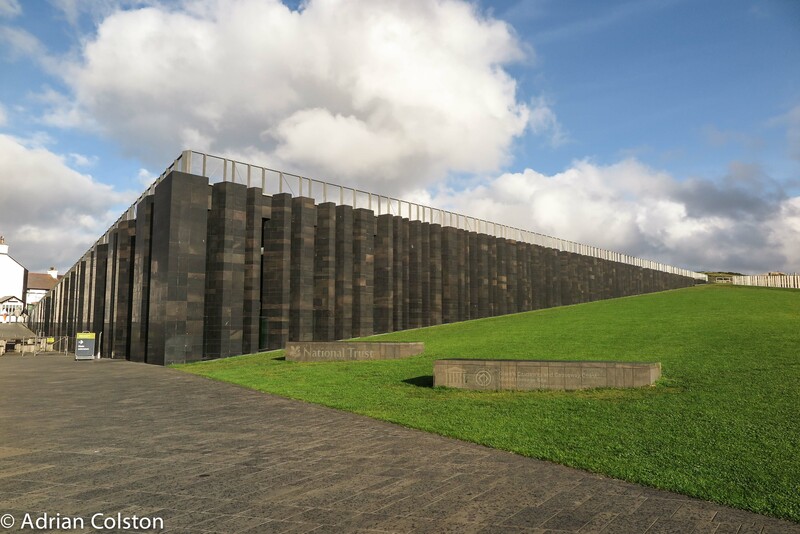 In 1978 £400,000 was spent on its restoration and further restoration was carried out in 2007 at a cost of £500,000. This ensured it was returned to its Victorian state. 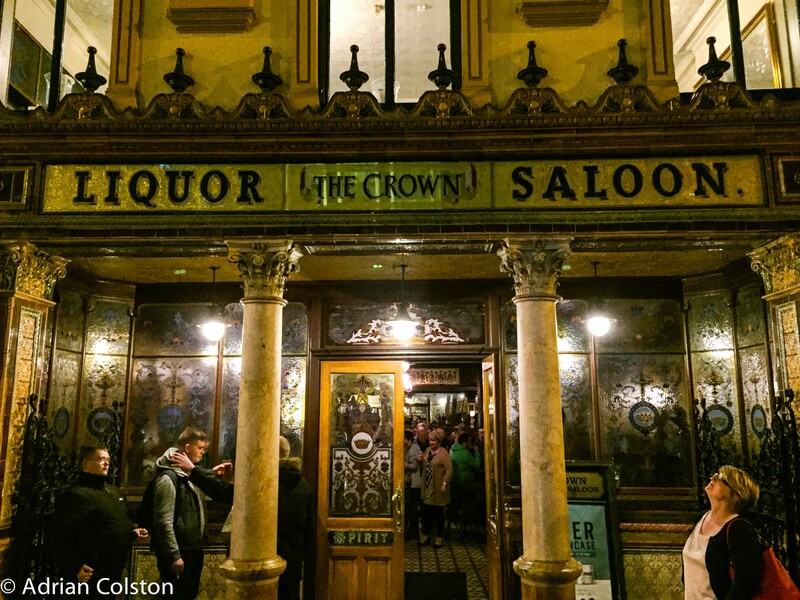 The Crown Liquor Saloon is directly opposite the Europa Hotel – which used to be known as the ‘most bombed pub in the world’ – during the Troubles it was bombed 28 times. 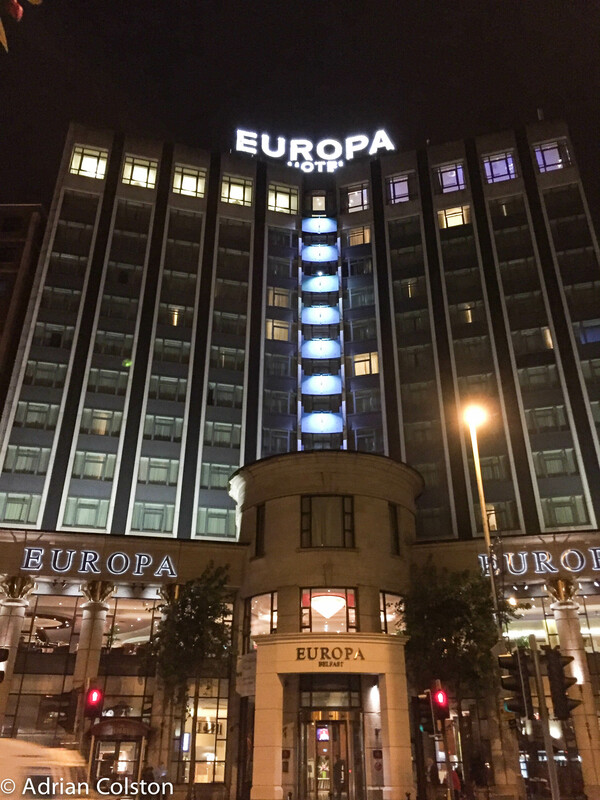 It has hosted Presidents, Prime Ministers and celebrities, it was the main accommodation for journalists covering the Troubles who dubbed it the ‘Hardboard Hotel’. The Crown Liquor Saloon due to its close proximity to the Europa often became collateral damage from the bombs. 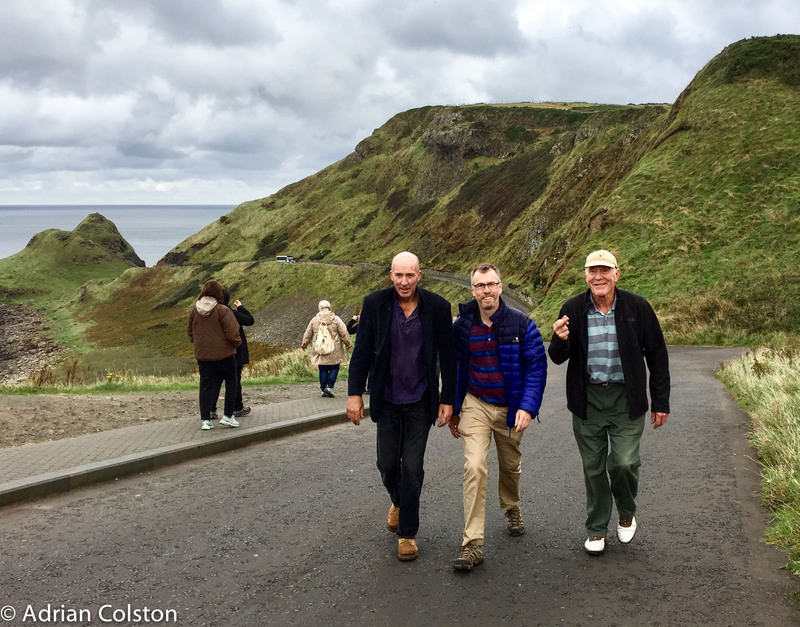 Following our visit to Carrick-A-Rede last week (see here) we then went on to visit the Giant’s Causeway which is 7 miles to the west. 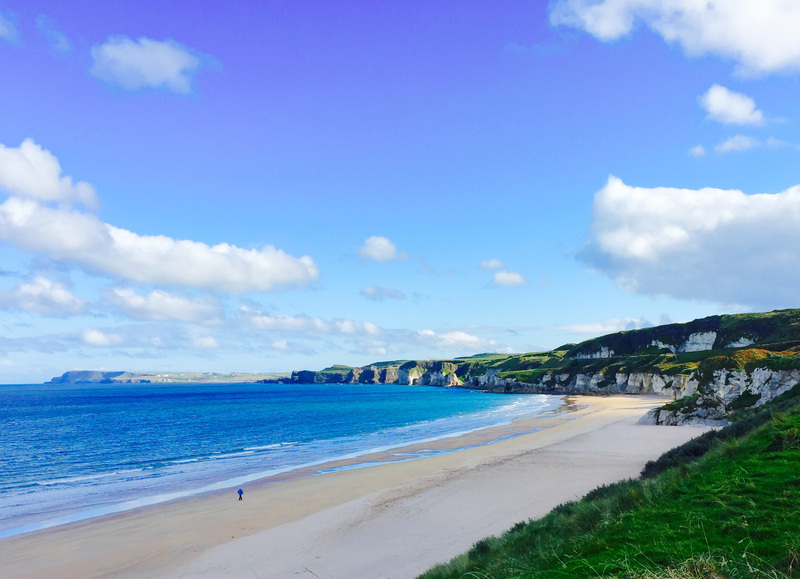 It is perhaps the most famous site in Northern Ireland – it is a World Heritage Site and is owned and managed by the National Trust. 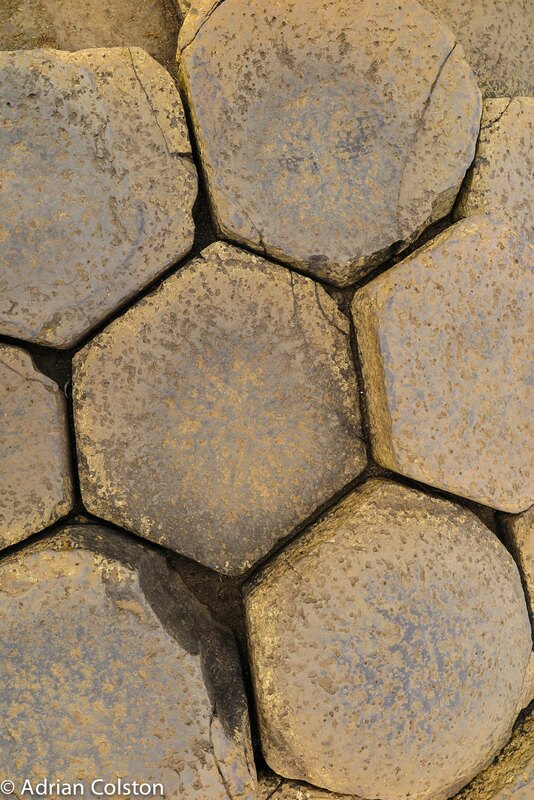 They were formed around 60 million years ago as a result of volcanic and geological activity. As the lava cooled it contracted and formed these shaped structures. 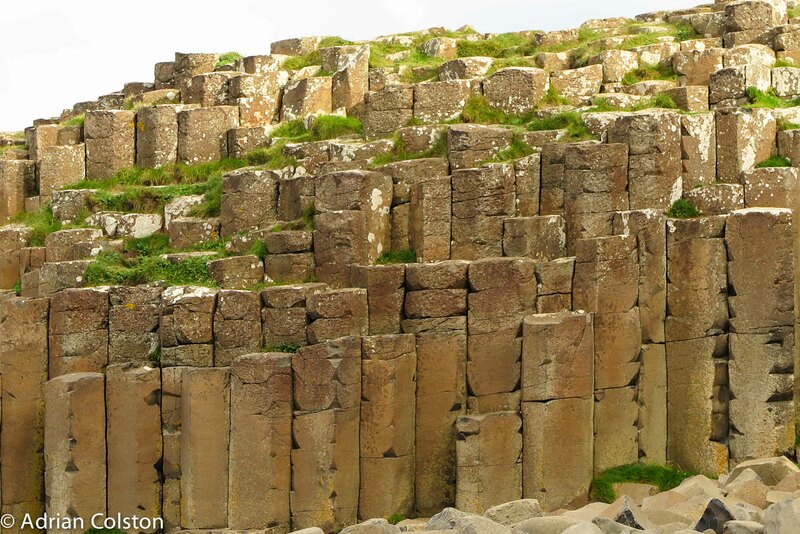 There are identical Basalt columns across the sea near to Fingal’s Cave on Staffa in the Western Isles. 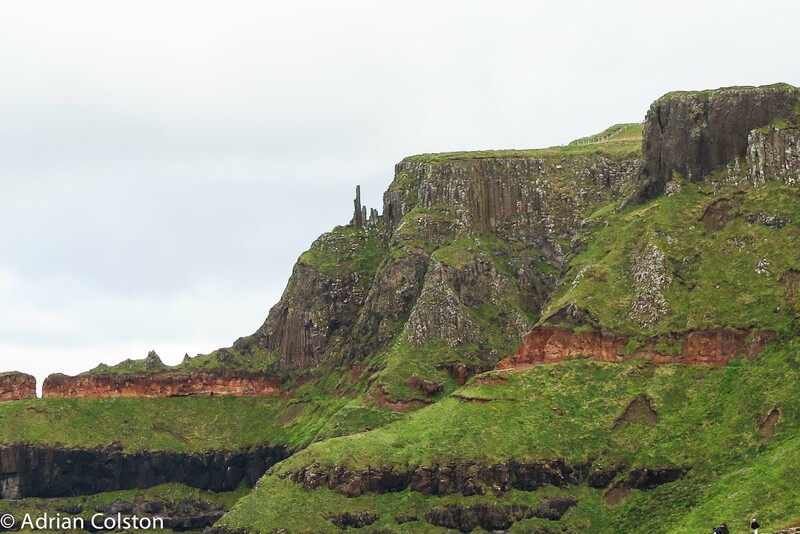 Many legends have arisen around the Giant’s Causeway – perhaps the most famous involves Fionn mac Cumhaill, who is now better known as Finn MacCool – the giant who lived there. 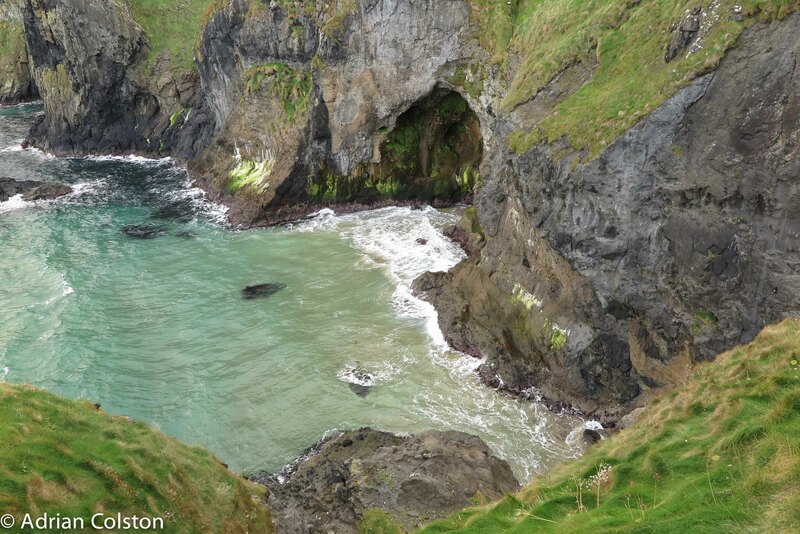 The story goes that Fionn was challenged to a battle by the Scottish giant Benandonner (of Fingle’s Cave). 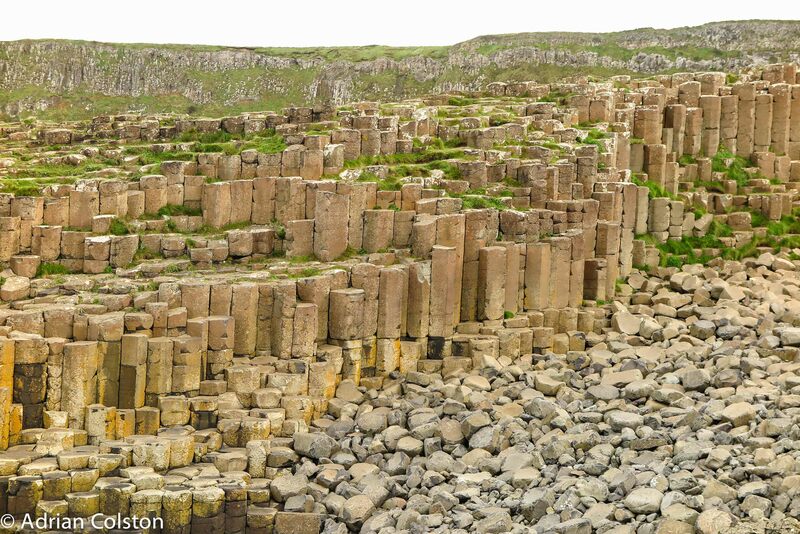 As a result Fionn built the causeway across to Staffa so they could fight. 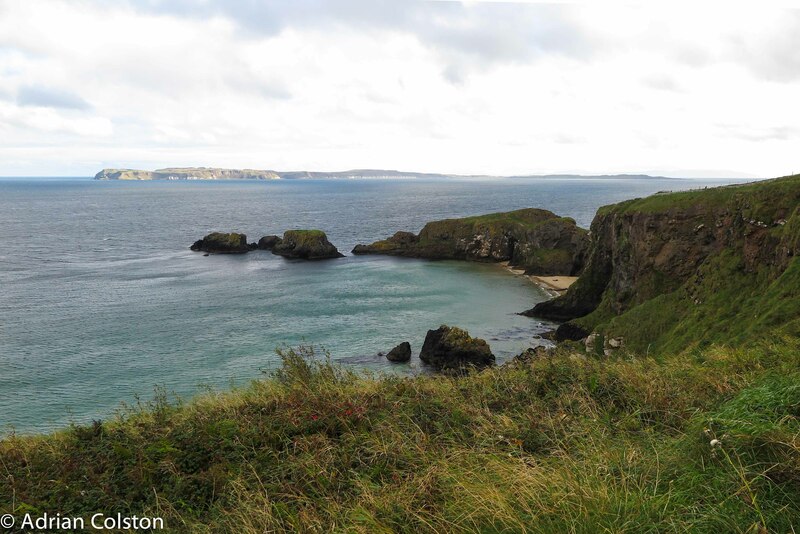 However when he got there he realised Benandonner was a much bigger giant than him so he fled back to Ireland. Benandonner followed him so Fionn’s wife disguised him as a baby in a creche. 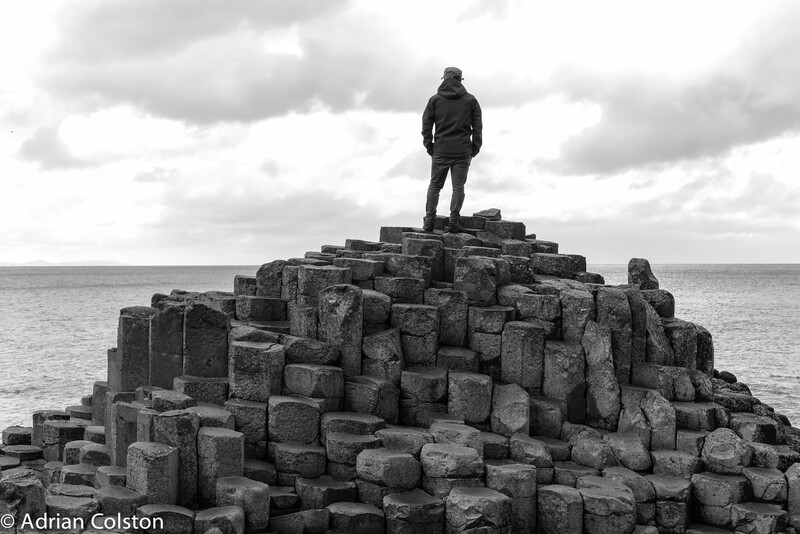 When Benandonner see Fionn’s ‘son’ he then flees back to Staffa destroying the causeway as he goes, thinking that if Fionn’s son is that big Fionn himself must be huge! In other versions Fionn is not a giant but a hero with supernatural powers. 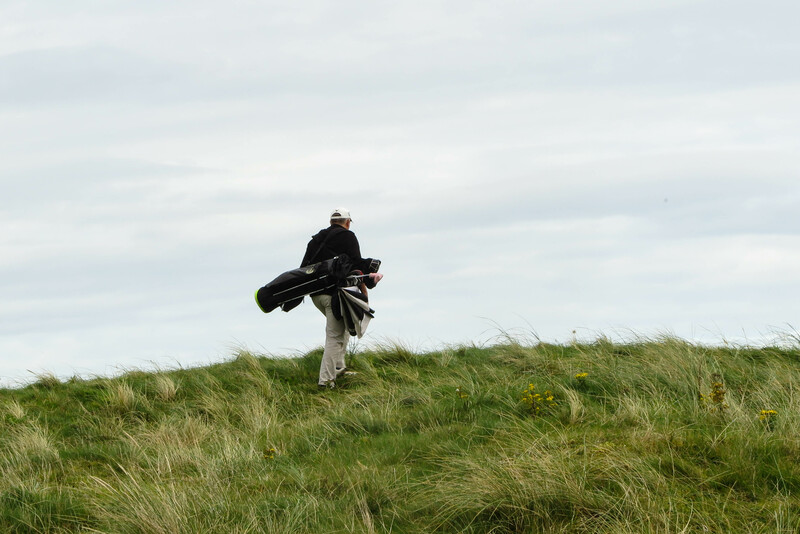 The National Trust makes much of the site’s magical qualities and they are not wrong to do so. 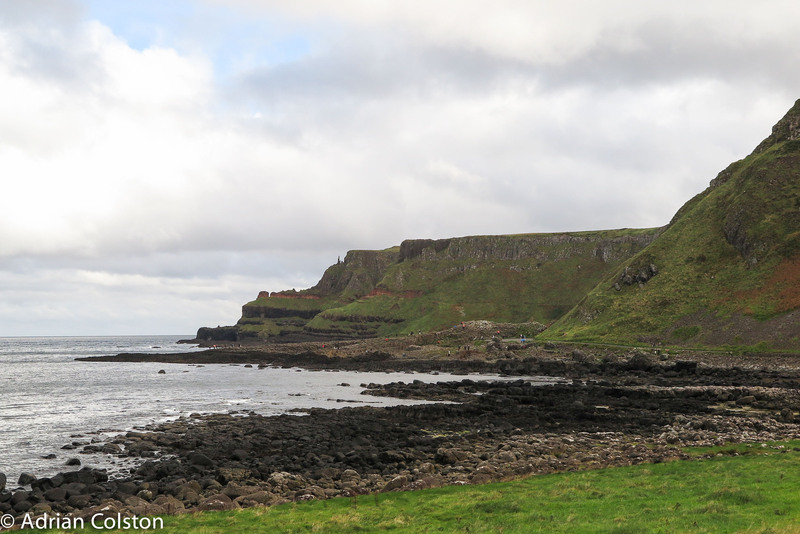 Skins, PK and H (in his golfing shoes) finish their 3 mile walk along the Antrim coast just past the Causeway. 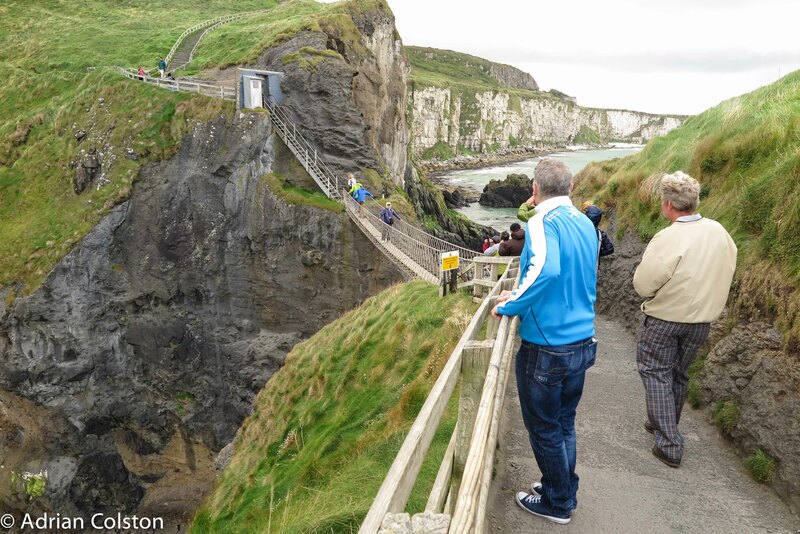 The National Trust’s award winning new visitor centre – I rather like it and it is very necessary as the site is the most popular tourist attraction in Northern Ireland receiving over 850,000 visitors per annum! 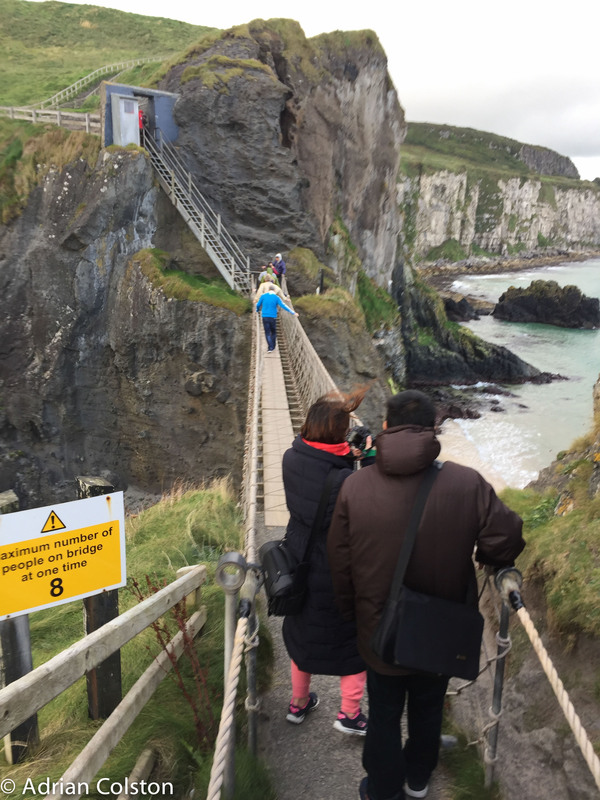 Last Tuesday morning three of us visited Carrick-A-Rede, otherwise known as the Rope or Wobbly Bridge on the Antrim coast. 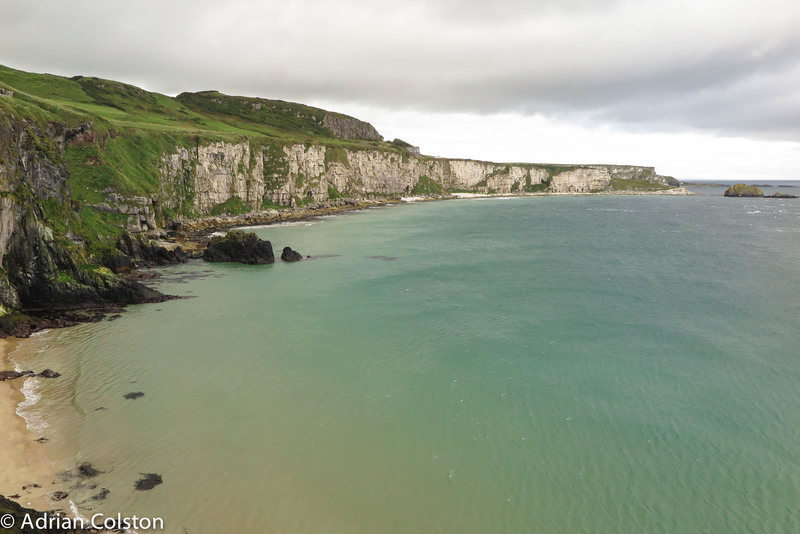 Carrick-A-Rede is from the Gaelic and means the ‘rock in the road’ – the ‘road’ being the sea route for migrating Atlantic salmon. 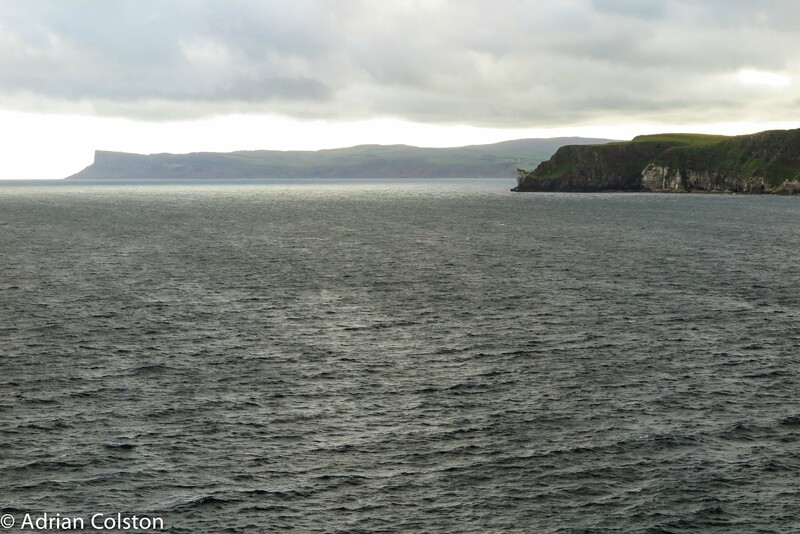 For over 350 years fishermen have strung a rope from the mainland across to the tiny island of Carrick to give them access to the best spot for catching the migrating salmon. 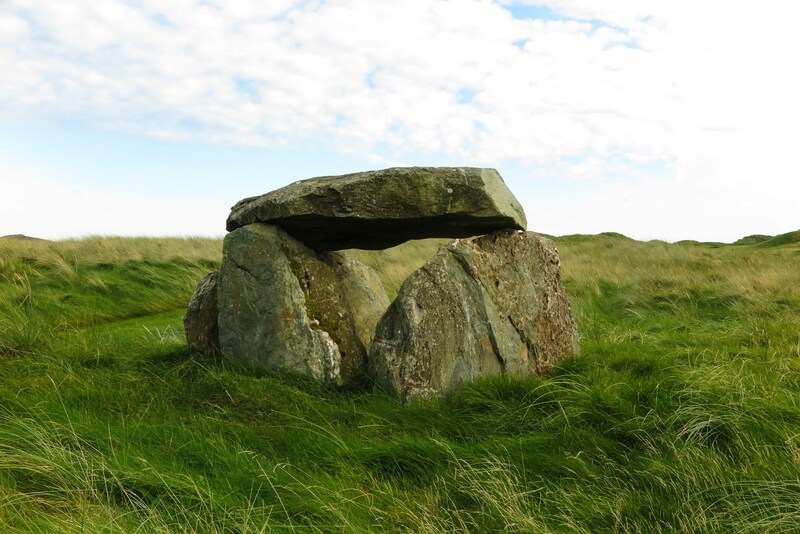 Today it is owned and managed by the National Trust and is a major tourist attraction. 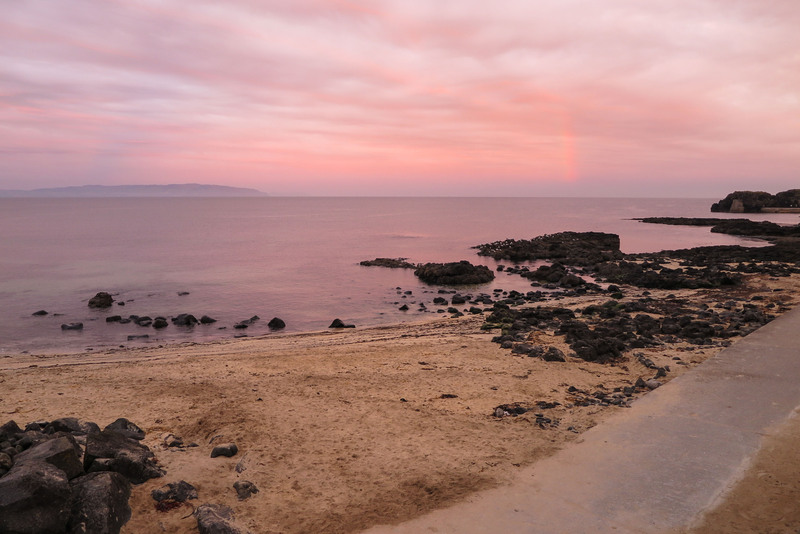 The walk to the bridge is just over half a mile and is set in stunning scenery – in the background you can see Raithlin Island and in the far distance you can just make out Arran and the Mull of Kintyre. Successfully across – it was much more tricky than it looks! 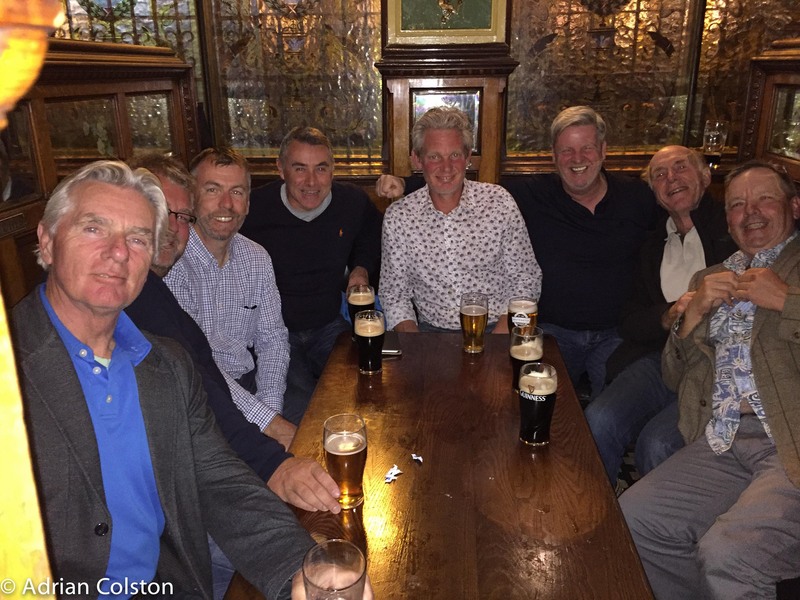 I’ve just got back (7am flight from Belfast to Exeter this morning …… very early start) from a 7 day golfing holiday in Northern Ireland and Eire. 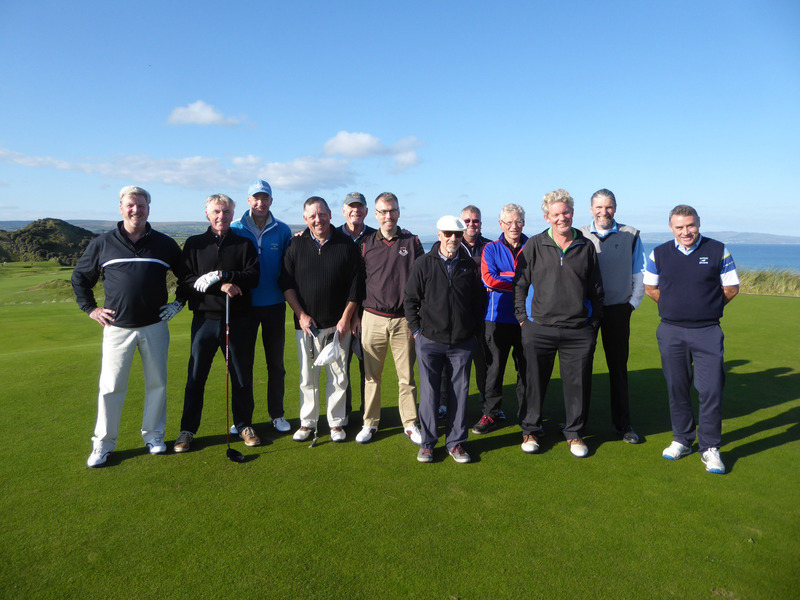 Twelve of us went from the Exeter area and played five rounds of golf at four different courses. 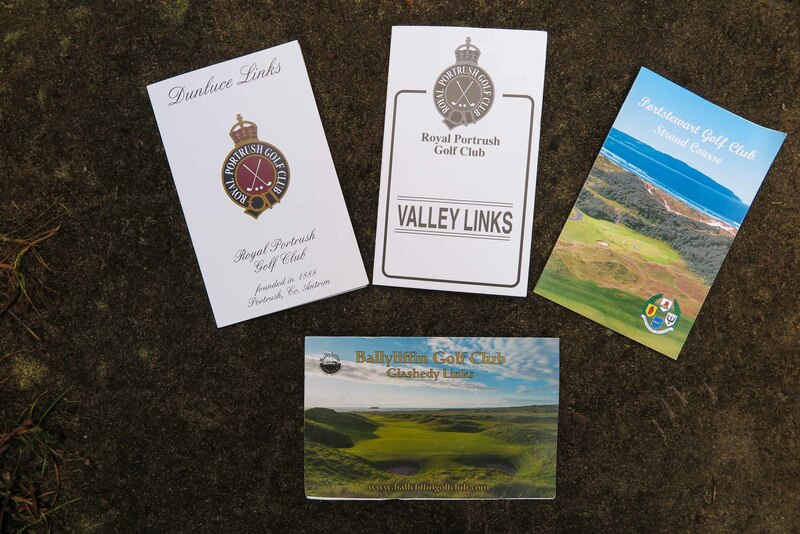 We even entered the Great Northern Links Challenge competition but that’s enough about that element. 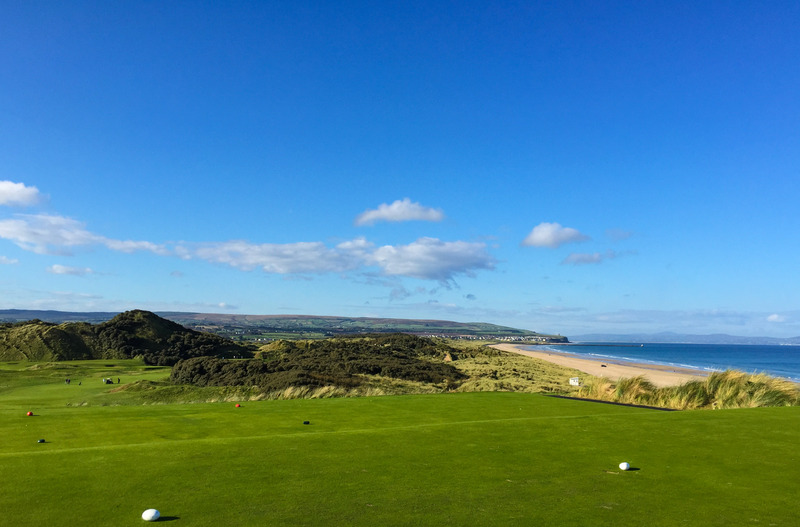 We were blessed with the weather – first night sunset at Portstewart – red sky at night…..
We played at four top golf courses: The Dunluce at Royal Portrush; the Valley Links at Royal Porthrush; The Strand Course at Portstewart and the Glashedy Links at Ballyliffin. 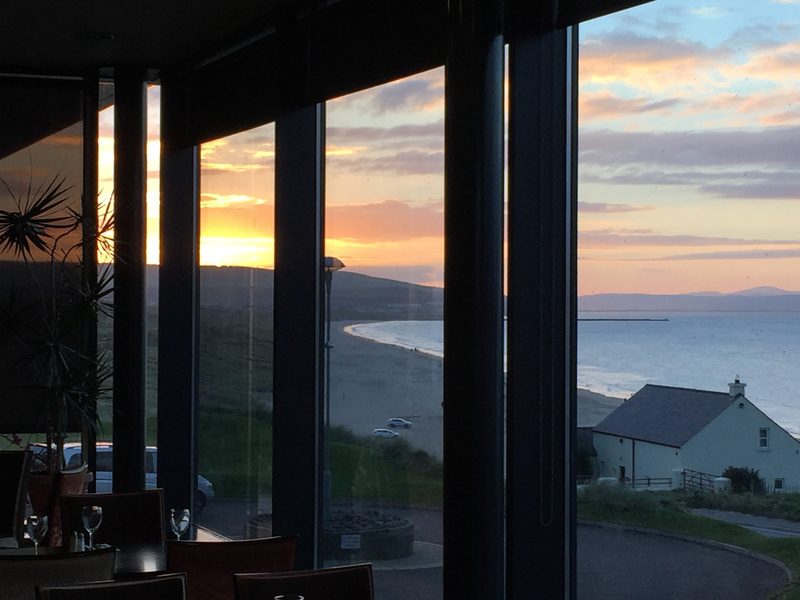 Another Portstewart sunset – this time from the Clubhouse – Portstewart will be hosting the Irish Open next year. 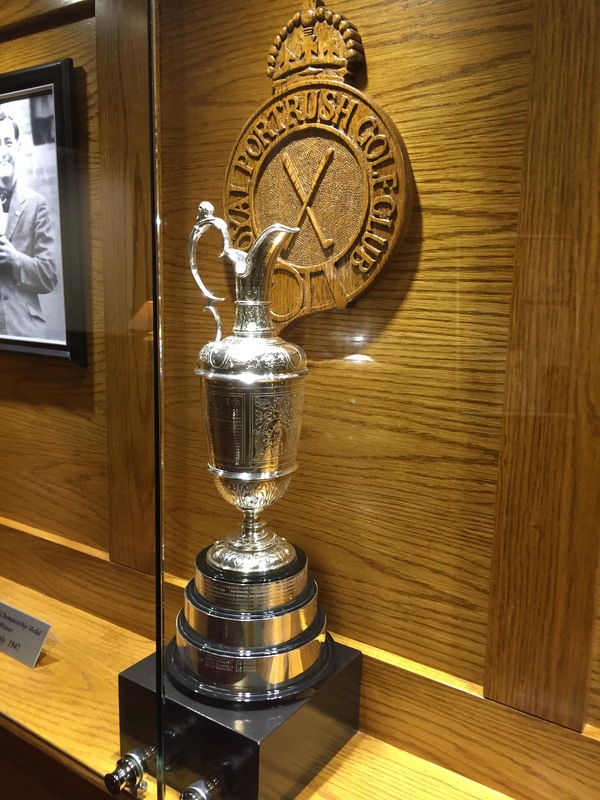 This is a replica of Darren Clarke’s Claret Jug which he won in 2011 in the Open at Royal St George’s in the Royal Portrush club house – Darren Clarke is a resident of Portrush and a member of the Club. 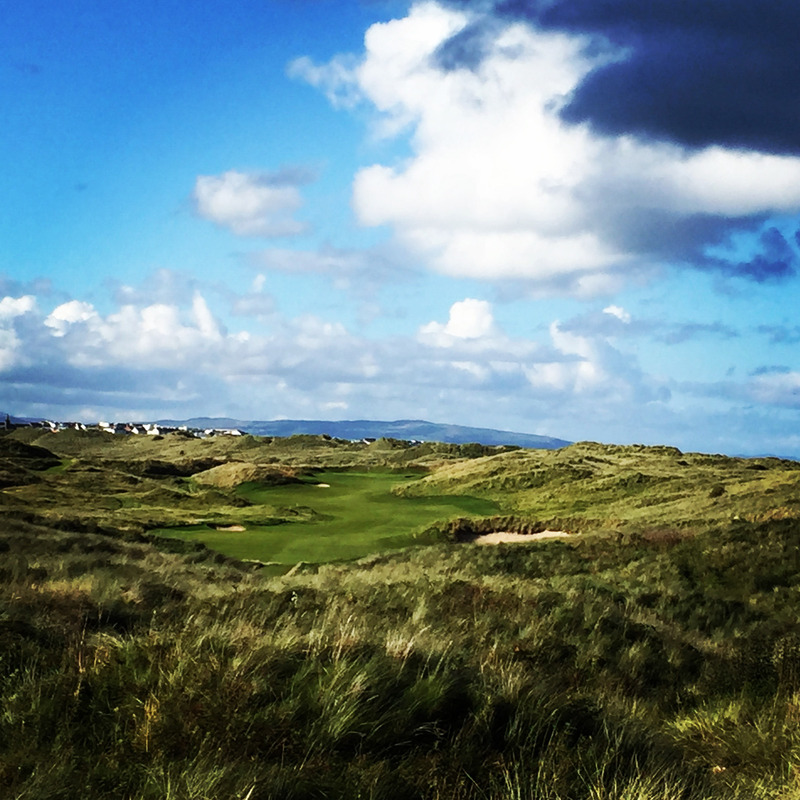 Royal Portrush will be hosting the Open in 2019 and this is one of the new holes that has been created especially (the current 17th and 18th holes will host of the hospitality tents so two new holes have been created). Our final round of the trip (and our first last Monday i.e. 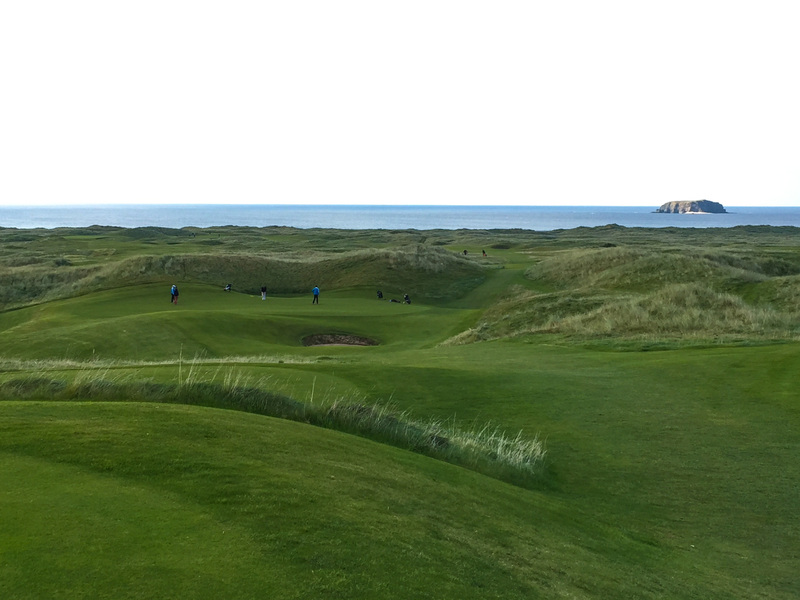 we played this course twice) was at Glashedy Links at Ballyliffin in County Donegal. 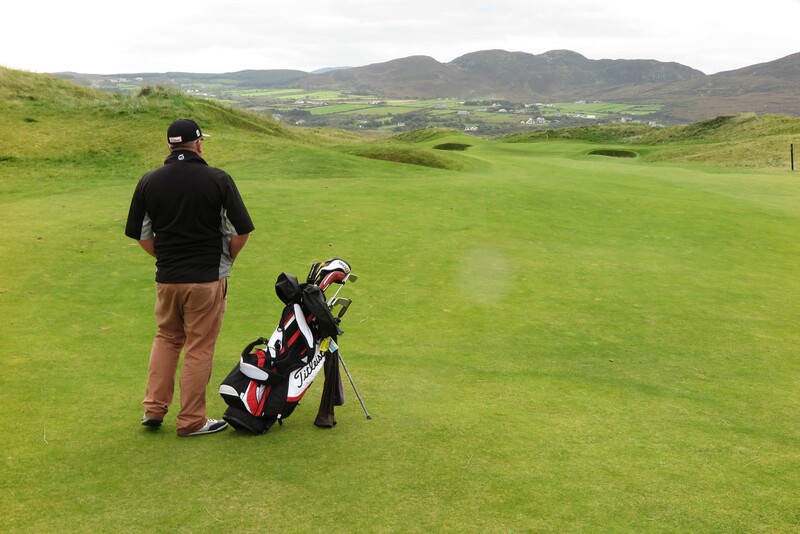 Standing on the 7th tee with the green beside the loch and mountains in the background. 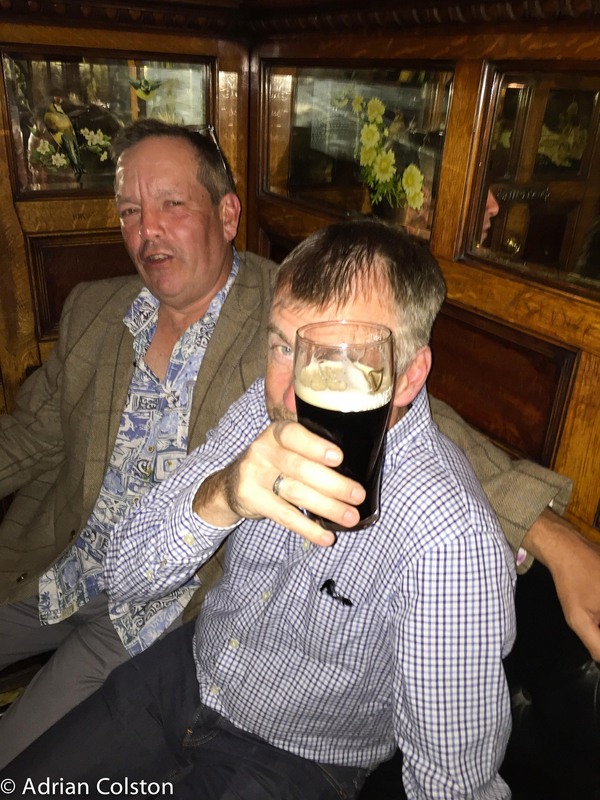 Thanks for the great company and thanks to Ado for organising. 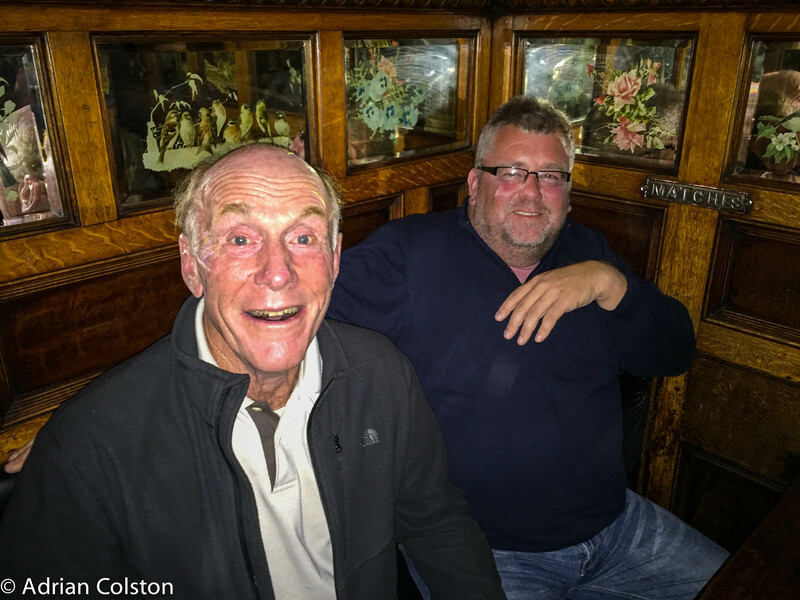 I’ll do a couple more posts on this trip which will feature a some of our ‘cultural’ visits …….